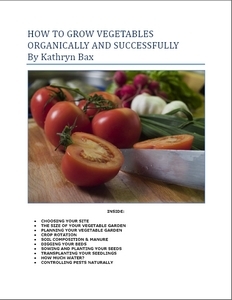 A growing number of agricultural machinery makers are developing and producing organic farming equipment to enable farmers to reduce weed burdens and stimulate crop growth. While tined weeders that are able to remove unwanted plants from between plant rows have been long-established, more recent developments include systems that are able to identify and eliminate weeds from within the plant rows themselves. 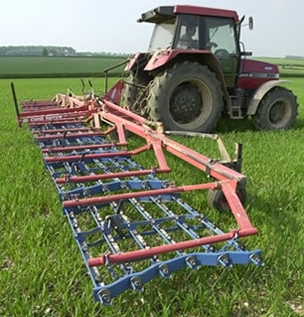 Tined weeders represent one of the simplest methods of removing unwanted species from both grassland and cropped land, depending on the crop being grown. Multipurpose tools such as comb harrows consist of fine spring tines, mounted on a contour-flexing frame. Picture left: A tined weeder comb harrow. While their main use is for removing weeds, this organic farming equipment also breaks up capped soil, allowing more air into the upper profile to allow water to both percolate through when dry and to improve evapo-transpiration when wet. In addition, it breaks up slug eggs to prevent population development. The same tool can also be used for seedbed preparation before sowing a crop. For grassland work, tined weeders and the simple chain harrow have a considerable role to play in keeping pastures free of dead thatch and knocking free the roots of large weeds such as docks. A relatively high forward speed with the attached tractor is necessary to achieve the desired effect with both types of implement, but this can do an excellent job of aeration as well as weed and thatch destruction. More advanced methods of organic weed removal have been developed by firms such as the UK’s Garford Farm Machinery. Its Robocrop is claimed able to work not only in vegetable row crops but also in narrow row cereals and multi-line (carrot type) rows in beds. This modern type of organic farming equipment uses a series of video cameras which produces images that are analyzed at a rate of 30 frames per second. These are able to identify weeds that are out of place – in terms of size and shape – according to the bulk of the crop present. The direction of the machine’s hoes is adjusted accordingly and automatically via a hydraulic side shift with anti-backlash action. Accuracy is generally 15mm at the camera, while with the addition of soil engaging discs better than 10mm accuracy is possible. Forward speeds of up to 12km/hr are possible, and higher speeds have been successfully employed, says the firm. Special pressure rams keep the soil engaging components in work and improve penetration in hard conditions, while slash blades ensure no ‘slip by’ of weeds adjacent to the row and also provide foliage clearance to prevent stripping. A further development of the Robocrop is the InRow Weeder, which uses the same video image analysis techniques to locate individual plants in order to mechanically remove weeds from both only between the rows but within them too, using a cam arm which moves in between plants when it identifies weeds present. 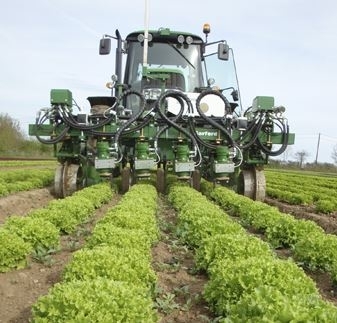 Developed for use on transplanted crops such as lettuce, cabbage and celery, Robocrop InRow can also be used on most crops that are planted with regular plant and row spacing where the plant foliage is clearly separated from the next plant. Forward speeds of up to three plant spacings per second are possible with the system, and the machine is available in sizes capable of covering up to 18 rows and six meters. Shares for this type of machine include the traditional duck foot A share, flat A shares, L blades, and the specially developed slash blades. Special raised bed system cultivators feature ridging plows in the wheel tracks and a range of special shares between the rows on the bed. Most models feature a pressure ram which adds weight to each unit and prevents bounce when working at high speed. Hoes can be front or rear mounted and can be guided by the tractor driver, by a second operator on a seat behind the hoe, or by a high speed video guidance system. The full utilisation of the nutrients and fibrous material provided by manure is a core principle in organic farming, and manure spreader makers are making a concerted effort to improve the way machines process material thoroughly and spread it evenly. Manure spreader maker Richard Western, for example, has developed a new range of machine with features such as closer-spaced center floor chains to improve material flow to the spreading rotors, while bodies are tapered so that they widen towards the rotors, allowing larger twin vertical rotors to be fitted. 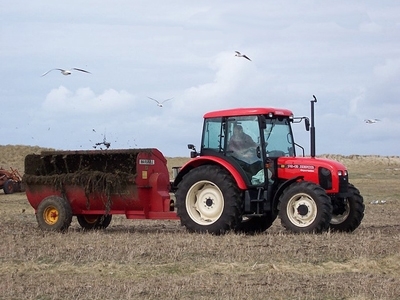 These finely shred fibrous manure to ensure it is spread evenly across the field surface, ensuring the soil’s organic material content is improved throughout the soil profile, and no lumps of straw or manure remain. Accuracy of application is further improved via a floor speed control which can be upgraded to a GPS ground speed system. The spreader is also equipped with load cells and a fully-automated weighing and recording system allows the input of driving width and required t/ha application rate, with spreading records downloadable via a USB output. Organic dairy farmers keen to make more of cattle slurry are able to make more of the material by separating it into solid and liquid fractions to utilize each separately. Benefits include reduced slurry storage capacity requirements and better options for utilising the material. Companies such as Bauer have introduced more compact, lower-cost bedding recovery units, incorporating self-contained portable slurry separation units, comprising intake and discharge pumps, a separator and a control unit, all mounted in a galvanized frame. Organic grassland farmers looking to maximize grass growth and the use of organic fertilizers and manures to stimulate it are among those who could benefit from grass reading meters. These measure grass covers – the quantity of grass available on a given area – using a ‘rising plate or, now increasingly, ultrasound waves. The latter type can be mounted to an ATV to allow coverage of large areas at up 20km/hr (12.5mph). he measured data can be manually recorded or, on more advanced versions, automatically stored in field multiples. It’s possible to then transfer this to a PC via the device's own supplied wireless network. Premium models feature GPS positioning, map display, automatic field changing and wireless data transfer. So from the simple chain harrow to the advanced auto spread-rate muckspreader, there is no shortage of organic farming equipment available to the organic farmer, whatever the size of the enterprise in question. The only choice is how advanced you want your equipment and how much you are prepared to pay.